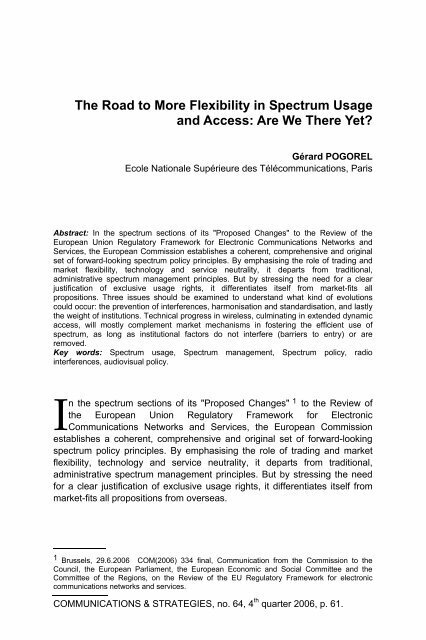 The Road to More Flexibility in Spectrum Usage and Access: Are We There Yet Gérard POGOREL Ecole Nationale Supérieure des Télécommunications, Paris Abstract: In the spectrum sections of its "Proposed Changes" to the Review of the European Union Regulatory Framework for Electronic Communications Networks and Services, the European Commission establishes a coherent, comprehensive and original set of forward-looking spectrum policy principles. By emphasising the role of trading and market flexibility, technology and service neutrality, it departs from traditional, administrative spectrum management principles. But by stressing the need for a clear justification of exclusive usage rights, it differentiates itself from market-fits all propositions. Three issues should be examined to understand what kind of evolutions could occur: the prevention of interferences, harmonisation and standardisation, and lastly the weight of institutions. Technical progress in wireless, culminating in extended dynamic access, will mostly complement market mechanisms in fostering the efficient use of spectrum, as long as institutional factors do not interfere (barriers to entry) or are removed. Key words: Spectrum usage, Spectrum management, Spectrum policy, radio interferences, audiovisual policy.  I n the spectrum sections of its "Proposed Changes" 1 to the Review of the European Union Regulatory Framework for Electronic Communications Networks and Services, the European Commission establishes a coherent, comprehensive and original set of forward-looking spectrum policy principles. By emphasising the role of trading and market flexibility, technology and service neutrality, it departs from traditional, administrative spectrum management principles. But by stressing the need for a clear justification of exclusive usage rights, it differentiates itself from market-fits all propositions from overseas. 1 Brussels, 29.6.2006 COM(2006) 334 final, Communication from the Commission to the Council, the European Parliament, the European Economic and Social Committee and the Committee of the Regions, on the Review of the EU Regulatory Framework for electronic communications networks and services. COMMUNICATIONS & STRATEGIES, no. 64, 4 th quarter 2006, p. 61.